Benedetto Caetani was born in 1235 at Agnani to an old and influential Roman family. 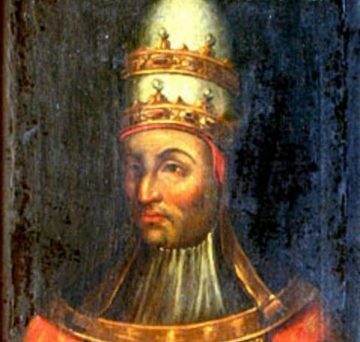 He studied law in Bologna and held many important positions in papal government, including that of papal legate to a church council in Paris in 1290 that succeeded in delaying the outbreak of renewed war between France and England. 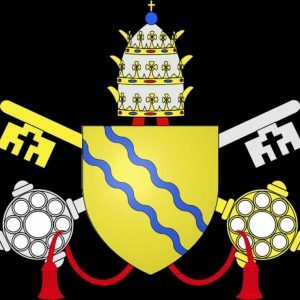 It was Cardinal Caetani who used his legal, canonical skills to orchestrate the abdication of the unhappy and saintly Pope Celestine V who wished to resign. Soon afterwards Caetani succeeded him as pope, taking the name of Boniface VIII. Because of his concern that Celestine’s followers would seek to restore him to the papacy, Boniface had him imprisoned under harsh conditions in the castle of Fumone, where Pope Celestine died within the year. Even though simony was suspected due to the large majority that elected him, that does not seem to be the case due to his intransigence once elected. Pope Boniface returned the papal seat immediately to Rome and quickly brought the city to order, dealing with every abuse without regard for anyone, not even his supporters. 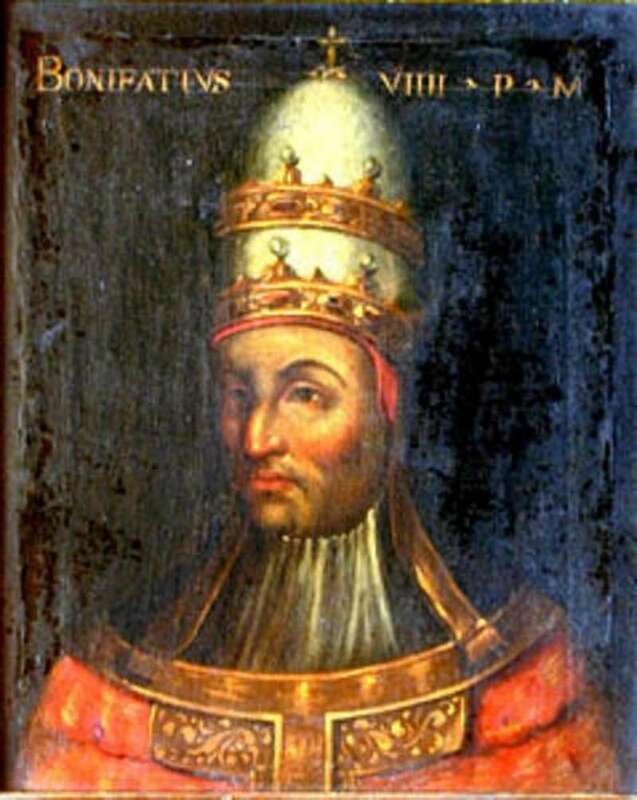 Bonfiface was a believer in the supremacy of spiritual power over all other temporal power and is considered to be, along with Popes Gregory VII and Innocent III in the theocratic line, which was the dominant theme of all papal politics in the Middle Ages. His temporal authority was vigorously challenged by the emergent powerful monarchies of western Europe. Chief among the temporal authorities with whom he dealt and imposed every possible means of his own authority, not excluding excommunications or war, were Henry IV, Frederick Barbarossa, Frederick II and Philip IV. His relations, particularly with France, were often contradictory and should be interpreted in the light of his objective, which was to affirm the supremacy of the Church and to defend its interests, both material and spiritual. He eventually engaged in a hard battle with King Philip, which consisted of admonitions, harshness, excommunications and pardons. During the course of his dealings with France, Boniface issued a bull that underlined the supremacy of the pope. France replied with a statement of royal independence. This caused the famous bull of 1302, Unam Sanctam, which included his most famous dictum, that salvation depended on a person’s being subject to the Roman pope. In this bull, we have the clearest statement and most sweeping claim of papal supremacy. Never before had the full implication of the titles supreme pontiff and vicar of Christ been made so manifest. Whoever succeeded Boniface, then, had a formidable pronouncement at his back to defend him from enemies. Boniface was courageous in these dealings and unconcerned with the consequences to himself. At that time it was unheard of to be treated with such arrogance and aggression as Boniface was at the hands of Philip’s emissaries. It is they who are responsible for an imfamous “slap” that he received from the two of them when he was already old and dressed in sacred vestments. It is noteworthy that Charles II of Naples and Frederick III of Sicily were appalled by the violence offered to the pope and were preparing to come to his aid. 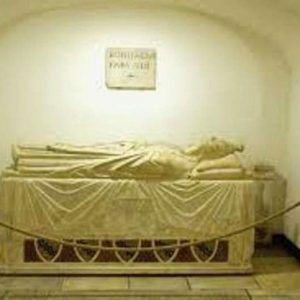 Boniface was in his late 60s when this experience occurred in September, 1303, and he died on October 11 of that same year after a reign of nearly nine years. Dante assigned Boniface a place in hell in The Inferno while he was still alive, an indication of his judgement on the pope’s attitudes and politics. However, the name of Boniface is remembered for the calling of the first jubilee in the history of the Church (1300) and for the great pardon the pope accorded to all. His intention was clearly to show that the Church had and exercised a power above all others: that of pardoning all guilt and of opening the gates of paradise. This was the essence of the Church: its spiritual and redemptory function. This was perhaps Boniface’s most profound message. The foundation of Rome’s La Sapienza University is also attributed to him. 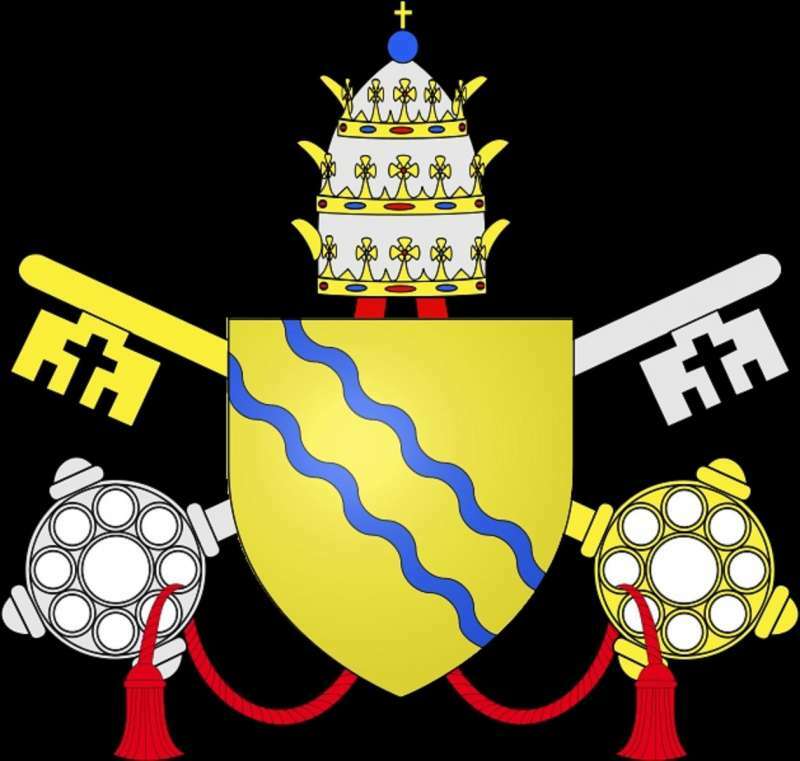 He added the second crown to the papal tiara symbolizing royal power over the initial crown, the symbol of spiritual power. 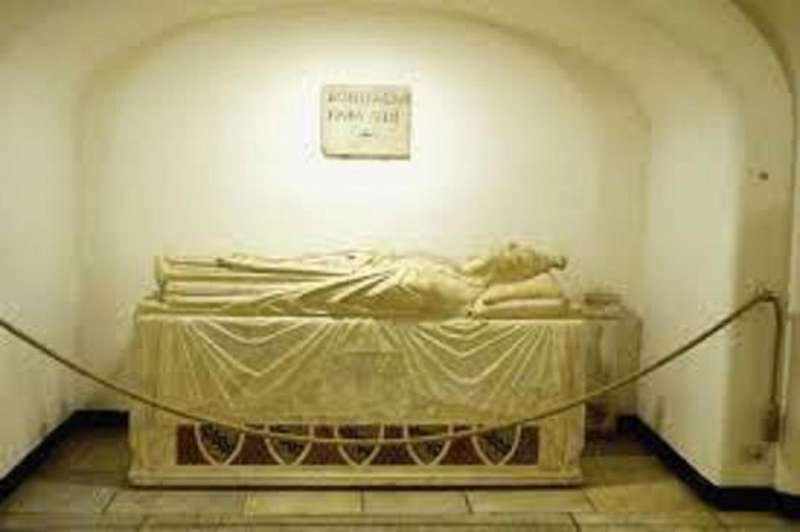 Pope Boniface died in 1303 and is buried in the Vatican grottoes.